Arnold Palmer is generally regarded as one of the greatest players in the history of men's professional golf. Nicknamed "The King," he is one of golf's most popular stars and its most important trailblazer because he was the first star of the sport's television age, which began in the 1950s. 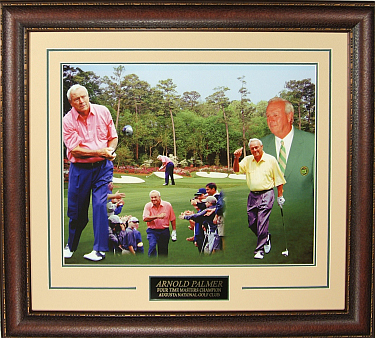 This is a collage of Arnold Palmer's "50 Years" Masters Collage unsigned 16x20 photo with Custom V Groove Matting and Premium Leather Framing.